Notes: 105dB Static. 0.5m and 45 degrees from exhaust at 3/4 maximum RPM. 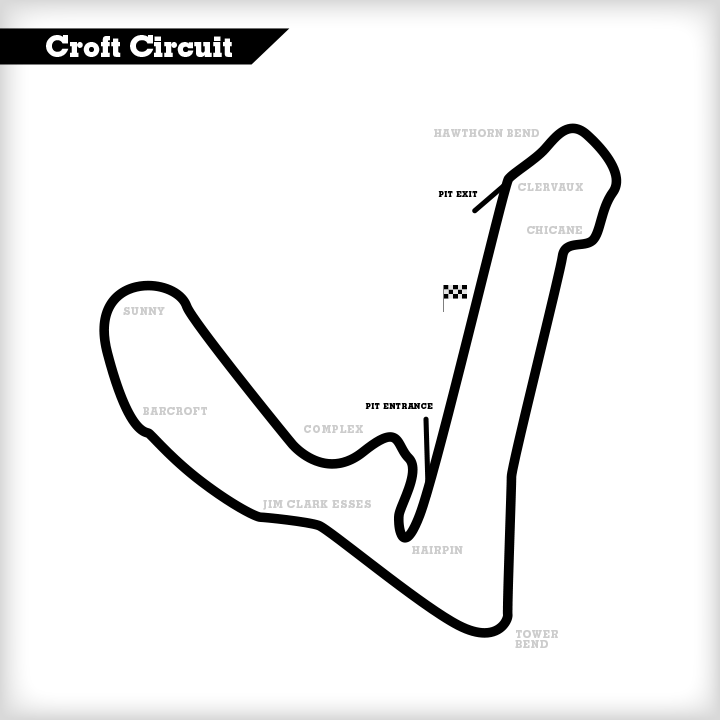 One of my favourite circuits on the BTCC calendar. It’s our only trip to the North East side of the country and when we get there the circuit is a real challenge with the local fans always giving terrific warm support. 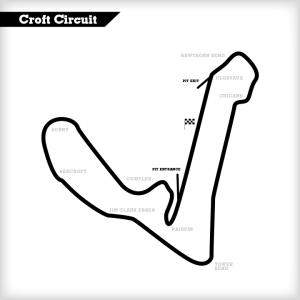 Croft is very clean and picturesque, neatly cut lawns and a neat compact pit lane with all amenities close by. As a driver it requires a high level of commitment, so racing and finding an optimum balanced setup is key to a fast lap. To talk our way round, the start/finish straight is faster than you think, preceded by a hairpin that is probably the tightest corner of any circuit in the UK. It’s a good drag down to turn 1, Clervaux, where we are well into 6th gear by the time we arrive. It’s a challenge being accurate with your braking point, so be careful not to out-brake yourself. Although entry to Clervaux is still pretty quick, in a BTCC car it’s 4th gear, but try not to take too much inside apex kerb as it’s quite aggressive and can throw you out. The car will drift from the apex and it’s easy to run out of road very quickly, so it’s easy to drop a left wheel in the gravel, especially if too much entry speed is carried, so my suggestion is build up here. Quick squirt through a kink to Hawthorn Bend, which is a long, never-ending right-hander, which leads up to the Chicane, so we’re down one gear and then get the front of the car in tight and try and keep it there. If you get on the gas too fast the car can run wide through the corner, which will compromise speed through and, more importantly, exiting Chicane. So keep car tight and line up Chicane. Be careful with cold tyres through here on the first lap as it will be first time you really need the right rear, so the back end can step out on exit if you attack too hard. You really need to be inch perfect through this right-left Chicane, and carry as much speed as possible as it’s a long run down to Tower Bend after. So you’ve made it through the Chicane. On the run down to the 90-degree right Tower Bend, this straight is quite bumpy and water can collect in hollows when wet, so watch out for aquaplaning down this section. In the braking zone for Tower there are two crests in the road and the target is to brake on the second one, but beware if you hit the brakes exactly on it or after it as the car can skip as the road drops away, so you think you can brake later but the circuit can catch you out. Saying that, you can be quite brave into Tower as it does have a bit more track to play with. We brake all the way into the apex, trying to get on the gas as hard and early as possible because again exit is critical. Stay off the exit kerb as it costs you time, then you’re on the run down to the ultra-fast left-right Jim Clark Esses, which are a big commitment flat out in 6th gear. You do have run off, but still need to be on your game using all of the flat apex kerbs on both left and right sections. This may be the fastest point of the circuit on exit and again it’s a 6th gear corner next, which is a right-hander called Barcroft. It’s probably my favourite corner of the track. Don’t be afraid to use a lot of apex kerb – getting through the corner fast is not so much the issue, but hanging on to and stopping the car after definitely is. Through the very fast Barcroft and then hard on the anchors, slamming it down two gears for a long double right Sunny In and Sunny Out. Again, quicker than you think, but very easy to overcook it on the way in and way out, so you need to be precise. In the wet sometimes you can find more grip around the outside off the racing line through Sunny Out. Also, be careful not to drop your left wheels on to the left kerb at mid-point of the two corners as it can drag you on further and into trouble. Sunny Out points you back towards home for another blast up to the final complex. The first 90-degree left is pretty fast still and you need to hold it tight, but you can carry more speed than you think through here. Through the long left in 4th then down two to 2nd for a tight right-hander and a short blip down to the final Hairpin. Watch not to drift too wide out of the right as it costs time and can hurt tyres. The final Hairpin is the last chance for that last-gasp overtaking manoeuvre. If you’re leading, stay tight and watch you don’t run wide on the exit. If you’re following, see if they leave the door open and an opportunity can open up. If not, cut wide and see if you can sling shot for a good run back up the start/finish straight.